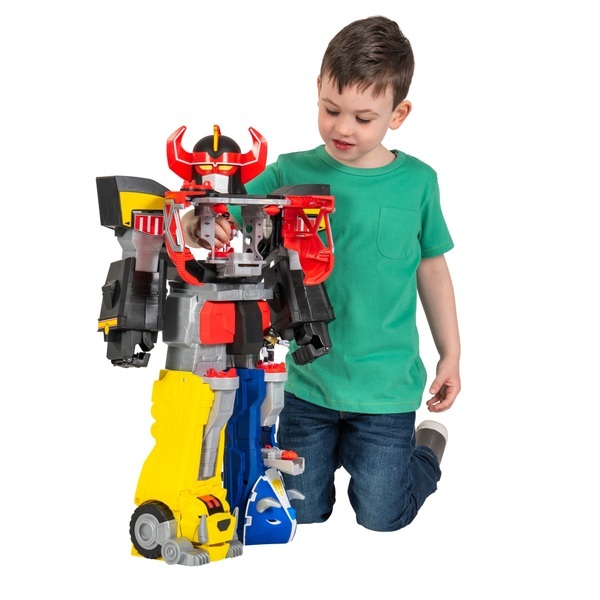 With the Fisher-Price Imaginext Morphin Megazord Power Rangers kids can control the action with four activation Power Pads! See Megazord’s chest open up, eyes light up and cannons pop out! Turn another Power Pad in the chest to fire Power Coins and push the button above the left knee to fire projectiles! Turn the Power Pad above his right knee to morph Megazord’s foot into a chomping sabretooth! The adventure continues on Megazord’s back that features a jail cell, a place to meet with Zordon, an elevator and lots of levels and platforms for figures to stand on. You can even place a figure in Megazord’s head! Includes Morphin Megazord, Red and Black Power Rangers figures, 6 Power Coins and 7 Power Missiles.